Brennan Nichols, 25, and Samuel Robles, 25, were both stabbed early Saturday morning in the 2700 block of Roosevelt Street. About 12:55 a.m., officers responded to a the scene of the fight, which involved roughly 10 people, on the 2700 block of Roosevelt Street. . . . Witnesses of the fight said several white men ran from the area in various directions. Apparently, the men had a little post-Thanksgiving steam to release. Police are still investigating, and three more arrests have been made. Times of economic uncertainty make us all the more thankful for the little things on this Thanksgiving Day 2008. Things like a roof over our heads, food on our tables, our health, you our readers, and the new MacBook Pro that will allow us to keep this site updated from anywhere in the world. 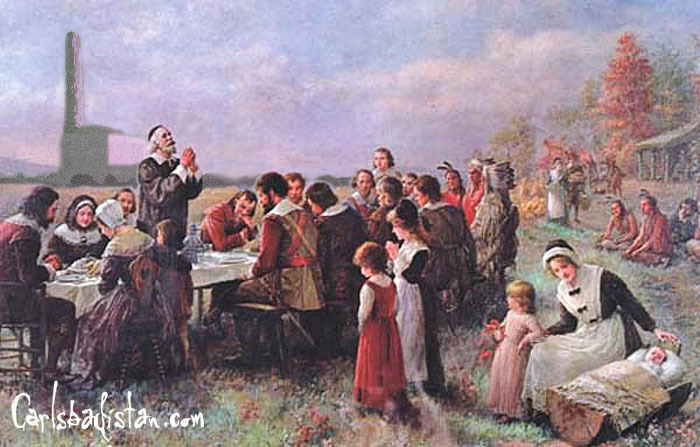 We’re also thankful that we live in the best place on earth, Carlsbadistan, and that you are our neighbors. 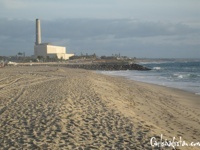 Happy Thanksgiving, Carlsbad! If you have something you are thankful for, please leave it in the comments. Governor Arnold Schwarzenegger has appointed Carlsbadistan’s Dave Carothers, 51, to the Fair Employment and Housing Commission, according to a story in the Imperial Valley News. Carothers has been a managing partner at Carlton, DiSante & Freudenberger since 2000. From 1997 to 2000, Carothers was a partner at Chapin, Shea & Carter. He was a partner at McInnis, Fitzgerald, Rees, Sharkey & McIntyre from 1985 to 1997. Carothers is a veteran of the U.S. Navy. He earned a Juris Doctorate degree from the University of Southern California School of Law and a Bachelor of Science degree from California State University, Dominguez Hills. This position requires Senate confirmation and the salary is $100 per diem. Carothers is a Republican. Carothers still needs to be confirmed by the Senate, but we’re going to go out on a limb and congratulate him anyway. If you, like us, just can’t get enough Christmas cheer each year, then this may be something to check out. Legoland is going to light their Christmas Tree on December 1, 2008 and then turn it on every night until Christmas, of course, it’s a little bigger deal than just turning on the light. 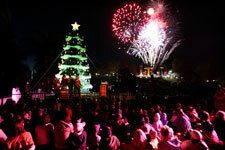 The world’s largest LEGO® Christmas tree lights up LEGOLAND® California on Monday, Dec. 1 at 5:30 p.m. followed by nightly tree lightings until Dec. 24 at 5 p.m. A selected guest pulls the switch lighting the 30-foot-tall tree built with more than 245,000 DUPLO® bricks. 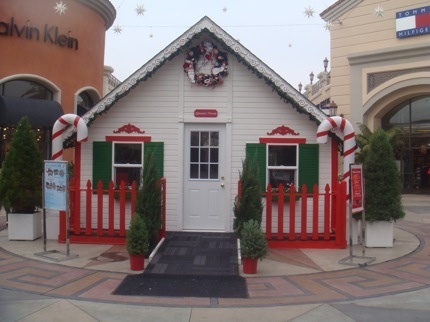 Holiday Block Party is Dec. 20 – 31 featuring life-size LEGO Santa plus nightly fireworks. Designed for children 2 to 12, the family theme park has more than 50 rides, shows and attractions. All of this (plus performances by Drew Seeley of High School Musical: The Concert and 8th place American Idol finisher Michael Johns) is included with the price of admission (kids 3 – 12 and Seniors 60+ $52; Adults $62). General Parking $10. Information: (760) 918-LEGO. It’s working. 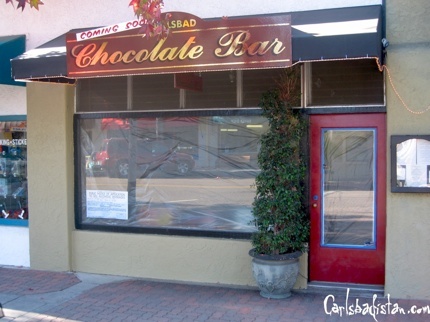 We can hardly wait to sample some of The Carlsbad Chocolate Bar’s goodies. Looks like even Santa Claus has been hit by the recent economy woes as he’s spending a lot of time loitering at the Carlsbad Premium Outlets this holiday season. Apparently, he’s been picking up a little extra cash by charging kids to have their pictures taken with him in the Santa House in Center Court. Proceeds will benefit the Carlsbad Boys & Girls Club, so picture up and smile. Think the economy has killed the advertising business? Not yet. The Carlsbad Tourism Business Improvement District is getting ready to sign off on a $350,000 ad campaign for the city of Carlsbad, according to a Barbara Henry story in the North County Times. These are challenging times for the hotel industry and we do need to get going on a program,” said Bill Canepa, board member of the Carlsbad Tourism Business Improvement District, as he discussed the proposed publicity campaign at a board meeting Monday. 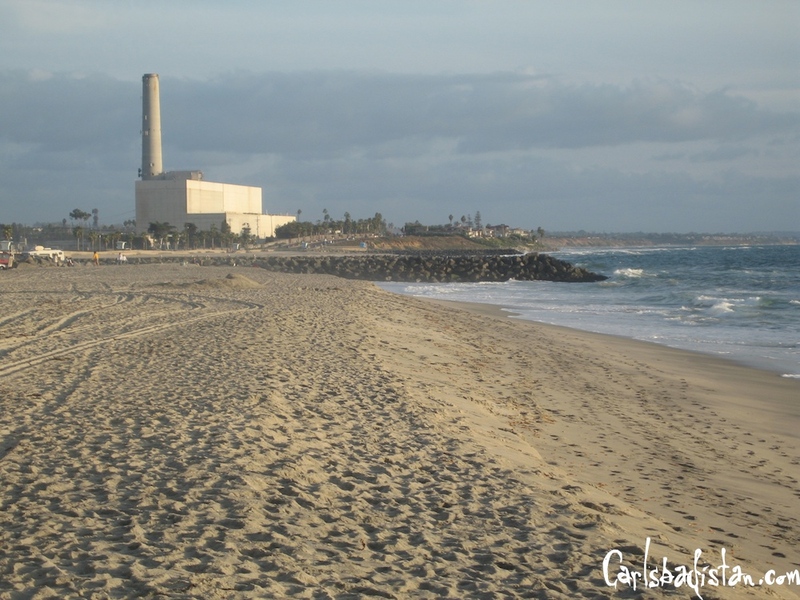 We’ve got some ideas: what about changing the name of Carlsbad to Carlsbadistan and using the power station and seawall as the logo? How rad would that be? Oh, wait. . . Yesterday, the host of Project Runway Heidi Klum spent the day with her mother and kids: Leni, 4, Henry, 3, Johan, 2 at Carlsbadistan’s Legoland, according to the blog Just Jared. 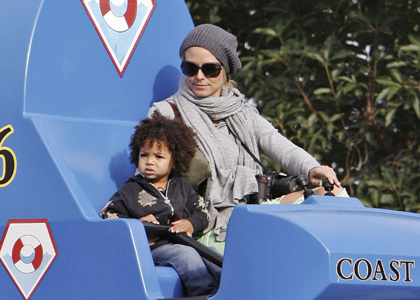 Heidi was seen taking to the skies and playing on the helicopter ride with her kids. Henry was seen polishing off a bag of cheetos. Johan sucked on his pacifier and was pushed in his stroller by grandma Erna. Hopefully, they didn’t spend too much time in little Las Vegas. . .
A couple weeks ago when LA Times writer Christopher Reynolds visited Legoland with his wife and daughter they noticed something odd while cruising through miniature Las Vegas. Among the wonders of this scaled-down Vegas is a quickie-wedding chapel (below). Now, thousands of visitors have probably strolled right past it, since it’s not as tall as the fake Eiffel Tower, as familiar as the fake New York, New York skyline, or as splashy as the faux hotel fountains. But it’s clever. . . . If you wait and watch, an aged groom (in tuxedo with cane) and young, blond bride come striding out of the chapel, headed for a waiting bus. The bride is wearing red boots and either a red miniskirt or hot pants, it’s hard to say. But what startled the three of us was the bride’s top. . . . There didn’t seem to be one. While Legoland’s Julie Estrada later assured Christopher that the woman is indeed wearing a white blouse, we’re not so sure. It kind of makes us think our old April Fools story may not have been as over the top as we thought. On Thursday November 20, 2008 Brian Lefler, 29, was arrested in Oceanside, California after a “long foot chase” according to a story on 10News.com. Leifler was arrested for allegedly punching Barbara Novelich of Oceanside in the face and forcing her to the ground while robbing the Tamarack Beach Resort in Carlsbad early Sunday morning.